Airport High School (Carleton), "The Locker - School Store"
1-POS Station, Touch Screen, PRM ... sells candy, snacks, beverages, spirit novelties, and apparel items. Alpena High School (Alpena) "The Campus Closet." 2-POS Stations (smart-keyboard) + 1-Mobile Touch Tablet. All 3 Stations Process Credit-Cards. Store sells candy, snacks, beverages, spirit novelties, and apparel items. Anchor Bay High School Store (Fair Haven), "The Nautical Shoppe"
Teacher Contact: Ms. Denise Perfili & Ms. Christina Shelton , 586-648-2525 #2348 e-mail School store sells candy, beverages, spirit novelties, flowers, and apparel. (4-Front POS Stations, Touch Screen, PRM). Upgraded March 2013! Student store resembles a store in a shopping mall! Anderson High School (Southgate), "The Hideaway"
Armada High School, "The Tigers Den"
1-POS Station, Smart Keyboard, PRM ... sells candy, snacks, beverages, spirit novelties, and apparel items. Avondale High School Store, (Auburn Hills) "The Bee Hive"
Auburn Hills store carries candy, beverages, spirit novelties, 2 POS Sales Station, Touch Screen. Note: Special needs students participate in most of the store's operations with supervision by student seniors, and teacher's assistant. Belleville High School, "The Eye of the Tiger"
1-POS Station ... sells candy, snacks, beverages, spirit novelties, and apparel items. Boyne City High School, "The Rambler Mart"
Branch Area Career Center (Coldwater), "The Corner Store"
School store sells candy, snacks, beverages, spirit novelties, and apparel items. 2-POS Station (just upgrade to a POS Network). Britton-Deerfield High School, "The Hole in the Wall"
Byron Center High School, "The Spirit Store"
New school store sells candy, beverages, spirit novelties, gifts, and apparel. All items are professionally displayed. A 2 Station network (1-OfficeServer & 1-POS Stations) Touch , PRM. The store is open for business the entire school day. Tom's Para-pro helps supervise the student employees. Calhoun Career Center (Battle Creek), "The M.E.S.S." 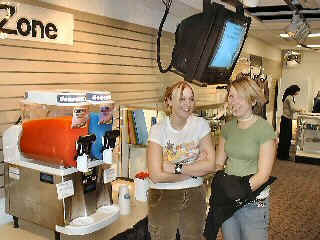 2-POS Stations .& 1-Back Office, Smart Keyboard, PFW ... sells candy, snacks, beverages, spirit novelties, and apparel items. Carlson High School (Gibraltar), "Marauder Galley"
1-POS Stations ... sells candy, snacks, beverages, spirit novelties, and apparel items. Is using the new Talon DVR 4-Camera System to teach careers in Security...! Carman-Ainsworth High School (Flint) "The Market Place"
2-POS Stations .. sells candy, snacks, beverages, spirit novelties, and apparel items. Cass Tech High School (Detroit), "Student Store"
Charlotte High School (Charlotte), "The Oriole Nest"
Cheboygan High School Store, "Tip of the Mitt"
School store carries candy, spirit novelties, ice cream, and apparel. 1 POS Sales Station, Smart Keyboard, PFW. Newly remodeled student store. Clarkston Senior High Store, "The Jungle Bungalo"
Teacher Contact: Ms. Christy Moore & Assistant, Vonny Hussain, 248-623-3516 Has a great island theme with palm trees and everything! 2 POS Cash Stations, Touch Screen. with a Server located in the classroom. Students sell popcorn, candy, student supplies, and school apparel. Daily Reports allow students to reconcile cash drawers and inventory. Doug's Marketing students operates a large, 32" Monitor as a Digital Sign broadcasting specials to the students in the Cafeteria....! Clarkston Jr. High School, "Eagles Lodge"
2-POS Stations, Smart-Keyboard Setup ... sells candy, snacks, beverages, spirit novelties, and apparel items. 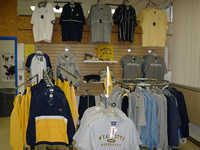 Clio High School, "The Mustang Corner"
Dakota High School Store (Macomb Twp. ), "The Cougar Den"
Teacher Contact: Ms. Nancy Atienza & Anne Senneca, 586-723-2940 e-mail School store sells candy, beverages, spirit novelties, and apparel. (2-Front POS Stations & Office Server). 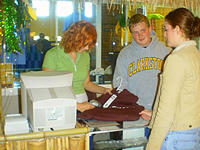 Student Store tastefully merchandised with the help of modern fixtures. 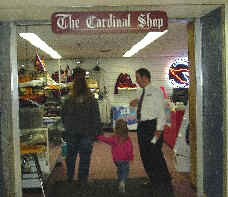 Davison High School Store, "The Cardinal Shop"
Dearborn-Fordson High School Store, "The Tractor Stop Shop"
Teacher Contact: Mrs. Georgene Stergalas, 313-827-1400 X143 e-mail Cool looking Student Store. 3 POS station, Smart Keyboard, PFW, for cookies, candy, cappucino, subs, pizza, bagels, apparel, gifts, and school spirit items. Many bright student managers. Does a brisk business during lunch time. Cass Tech High School (Detroit), "School Store"
Cody High School (Detroit), "The Cody Comets 1-Stop Shop"
Detroit Randolph Voc Center (Detroit), "The Ultimate Boutique" and "The School DECA Store"
The Boutique sell the latest in fashions & gifts for men & women. The School store sells candy, snacks, beverages, spirit novelties, and grocery items. POS station is setup on a grocery checkout lane with conveyor belt and everything! 1-POS Station @ each location. Detroit Renaissance High School (Detroit), "The Phoenix Nest"
Detroit Northwestern High School (Detroit), "The Colt Shoppe"
Dewitt High School, "Panther Pause Cafe"
School store sells candy, snacks, beverages, spirit novelties, and apparel items. 1-POS Station. Touch, PRM. E. A. Johnson High School (Mt. Morris), "The Mount"
Upgraded to 2-POS stations ...School store sells candy, snacks, beverages, spirit novelties, and apparel items. Edsel Ford High School Store (Dearborn), "The Thunder Zone"
Teacher Contact: Ms. Carol Ann Barr-Gutowski 313-271-8273 e-mail School store carries candy, beverages, spirit novelties, apparel, and the ever-popular Slushies. 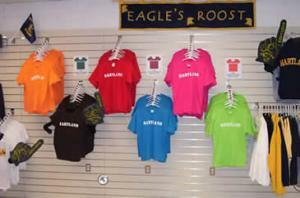 With 2 POS Sales Stations , Students are already Printing Barcode Labels for Apparel. Remodeled store includes carpeting, mall-like fixtures, and a TV Monitor that advertises specials to students. School store sells candy, unique gift items, spirit novelties, and apparel. 3 Station network (1-OfficeServer & 2-POS Stations) We were asked to re-use old POS equipment that were still in boxes. We were successful in making all the POS hardware work with their new PCs! A lot of $$ was saved in the process. Ferndale High School Store, "The Eagle Emporium"
School store sells candy, beverages, spirit novelties, cappucino, and apparel. 2 Station network (2-POS Stations). Attractively merchandised in remodeled store that resembles a store in a shopping mall! Fitzerald High School (Warren), "The Spartan Shop"
Flint Southwestern Academy (Flint), "The Knights Corner"
Forest Hills Central (Grand Rapids),"The Ranger Station"
Brand new store with a stunning glass/laminate counter. Sells beverages, candy, snacks, apparel, and spirit items. Upgraded 2-POS Stations, PRM, with Customer Display Monitors and an Office Server. Brand new school store. Sells beverages, candy, snacks, apparel, and spirit items. 1-POS Station. Paul just learned the school pos system and took it very fast! Forest Hills Northern, (Grand Rapids) "The Dawg Pound"
Flushing High School, "The Raider Spirit Store"
1-POS Station, Touch Screen, PRM ... sells: spirit novelties, and apparel items. Fowlerville High School, "The Coliseum"
Fraser High School, "Rambler Warehouse"
2-POS Stations, Touch Screen, PRM & Rear Marketing Monitor ... sells candy, snacks, beverages, spirit novelties, and apparel items. 2-Touch Laptops take advance Orders (Scan Student ID Cards) for Restaurant (Dine-in, Take-Out or Delivery) & Print to Expediter in Kitchen 3rd POS Station is a separate Cafe in the Library that gets all Food products from Matt's Kitchen & sends Reports to Matt's Office. Galesburg-Augusta High School Store, "The DECA Spirit Shop"
School store sells candy, beverages, spirit novelties, and apparel. (1-Tablet, Mobile POS Station). Garden City High School (Garden City), "Cougar's Corner"
Gennessee Int. Schools Teacher Resource Center (Flint), "The Teacher Discovery Center"
Unique, teacher store for several School Districts sells & rents instructional materials. Tracks teachers' usage-attendance. 2-POS Stations. Goodrich High School (Goodrich), "The Martian Market"
Grand Blanc High School (Grand Blanc), "The Student Store"
4-POS Stations & 1-Back Office ... sells candy, snacks, beverages, spirit novelties, and apparel items. School-Store has Upgraded to our new, POSitive Retail Manager Softare (PRM). Grand Haven High School, "The Buc Stop"
Store carries candy, beverages, spirit novelties, and apparel 1 POS Sales Station & 1 Back Office Station, Smart Keyboard, PFW. There was no on-site training or installation here! Scott used all our training materials and relied on Phone Support and his School Technician. School store sells candy, snacks, beverages, spirit novelties, and apparel items. 1-POS Station. Grosse Pointe North High School (Grosse Pointe Woods), "School Store"
Greenville High School (Greenville), "The Jacket Depot"
Grosse Pointe North High School, "School Store"
Groves High School ( Birmingham ), "The Falcon's Nest"
3-stations & 1-Back Office, Smart Keyboard, PRM ...sells candy, snacks, beverages, spirit novelties, and apparel items. Hamtramck High School (Hamtramck), "The Cosmos Corner"
Harrison High School (Farmington Hills), "The Hawks Nest"
Hartland High School (Hartland), "Eagle's Roost"
2-POS Stations/BO, Touch Screen, PRM, Customer Display ... sells candy, snacks, beverages, spirit novelties, and apparel items. Hastings High School (Hastings), "The Saxon Store"
Holt High School (Holt), "H-Town"
2-POS Stations ... sells candy, snacks, beverages, spirit novelties, and apparel items. Houghton High School (Houghton Lake), "Bobcat Lair"
Howell High School (Hwell), "Kilt Shack"
1-Touch Monitor POS Station ... sells candy, snacks, beverages, spirit novelties, and creates custom graphics for apparel items. Huron High School (New Boston), "The Trading Post"
New, remodeled location sells candy, beverages, hot coffee/cappucino, apparel, and slushies. Great location adjacent to Cafeteria. 2-POS Stations, Smart Keyboard, PFW. Huron Area Career Center (Bad Axe), "The Exchange"
Huron Area Career Center (Bad Axe), "Culinary Cafe"
Jackson Area Career Center (Jackson), "The Corner Store." Jackson High School (Jackson), "The Viking Store." 2-POS Stations & 1-Back Office ... sells candy, snacks, beverages, spirit novelties, and apparel items. Jefferson High School, "The Honey Tree." 1-all-in-1 Touch POS Station & 1-2-CAMERA DVR System ... sells candy, snacks, beverages, spirit novelties, and apparel items. Teacher Contact: Ms. Marsha Buckley , 734-419-2330 e-mail You think you were in a shopping mall! Beautiful retail setting 3 black POS stations for candy, apparel, gifts, and school spirit items. We have set up 3 POS Stations, Touch Screen, PRM. Kearsly High School (Flint), "The Hornets Nest"
2-POS Stations, Smart Keyboard, PRM, Customer Display ... sells candy, snacks, beverages, spirit novelties, and apparel items. Kent Transitional Center (Grand Rapids), "The KTC Retail Marketing Stores & Agriscience"
2-station Store & 1 station store ...Vocational-School stores sells candy, snacks, beverages, spirit novelties, and apparel items. Kent iSD Center (Grand Rapids), "Books & Nibbles"
Lahser High School (Bloomfield Hills), "The Knight's Castle"
School store sells candy, snacks, beverages, spirit novelties, and apparel items. 2-POS Stations & 1-Classroom station. 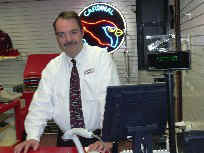 Gary Swain was the 1st Teacher to be POS Certified......Congratulations..! L'Anse Creuse High School Store "Lancer Locker"
L'Anse Creuse North High School Store "Crusader Goods Store"
Lake Shore High School (St. Clair Shores), "The Shorian Shop"
Lakeshore High School (Stevensville), "The Lancer Locker Room"
School store sells candy, snacks, beverages, spirit novelties, and apparel items. 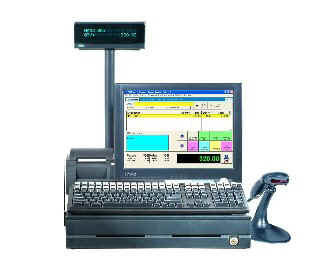 1-POS Touch-Monitor Station. 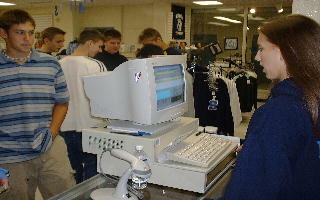 Lakeview High School (Battle Creek), "The Spartan Spirit Shop"
2-POS Stations . 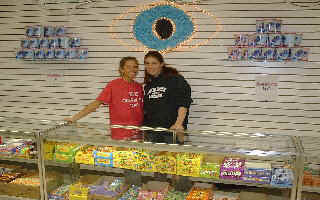 & 1-Back Office ... sells candy, snacks, beverages, spirit novelties, and apparel items. Lakewood High School Store, (Lake Odessa) "Vikings School Store"
Store carries candy, beverages, spirit and gift novelties, 1 POS Sales Station. Note: Special needs students participate in most of the store's operations. L'Anse Creuse High School (L'Anse Creuse), "The Lancer Locker Room"
2-POS Stations, 1 Smart Keyboard, 1 Touch Screen on PRM ... sells snacks, beverages, and apparel items. Lapeer Education & Technical Center (Attica), "The Bodega"
Teacher Contacts: Ms. Carrie Turner & Sherry Davis 810-664-1124 e-mail This is our 1st experience with a Vocational School. The teachers were very unhappy with their previous POS Software, so we migrated the Bodega to POSitive POS. We were able to re-use all their pre-existing POS Hardware and added POS Keyboards (with Hot Keys). 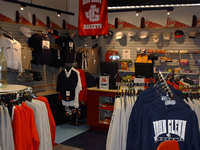 This large school store carries candy, beverages, spirit novelties, and apparel. The Bodega has 2 POS Sales Stations & 1 Back Office Station in the classroom. The POS Software is located on the School's Server and all 3 PC's are networked to it. We normally do not recommend using the School Server, as the POS Server......but in this environment it has worked great! The Bodega is fortunate to be supported by several on-site IT people who are very professional. We only wish more schools had this luxury! Candy, Gifts, Breeze-Freeze Slushes, Cookies make up the inventory mix at the Bodega. Lincoln High School Store, (Warren) "Abe's Corner"
Teacher Contact: Mrs. Marge Levinson, 586-758-8307 e-mail 4 POS stations.Touch Screen, PRM. Students sell candy, cookies, cold beverages, apparel, gifts, and school spirit items. Students take the store to their customers at Lunch! Teacher uses POS to track a cart load of products that are delivered and sold in the cafeteria. Students are using a Template feature in POS to track the assembly of assorted penny candy into larger bags for sale. Lincoln Park High School (Lincoln Park), "The Depot"
Teacher Contact: Ms. Ann Shannon & Para-pro, Carol 313-388-4552 e-mail The Depot has a great selection of School Apparel tastefully displayed. Students make and sell Otis Cookies. Other popular items include candy and assorted snacks. The Depot is operated by 2 POS Sales Stations. 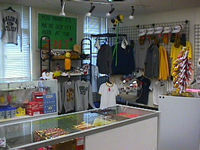 Marcellus Jr/High School Store, "The Cat Shack"
School store sells candy, beverages, spirit novelties, and apparel. 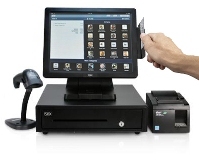 (1-Tablet Mobile POS Station). Mancelona High School Store, "The School Store"
School store sells candy, beverages, spirit novelties, and apparel. (1-Touch Laptop, Mobile POS Station). Maple Valley Jr./Sr. 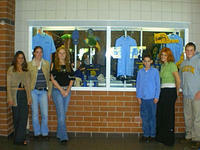 High School Store, "The Lions Cafe"
School Cafe sells candy, cold & hot beverages, spirit novelties, and apparel. (1-Touch Laptop, Mobile POS Station). ---using Credit-Card EMV-Chip terminal -- safe, fast & secure.! -using Credit-Card EMV-Chip terminal -- safe, fast & secure.! Montague High School Store, "The DECA Store"
Mt. Pleasant High School, "The School Store"
3-POS Stations & 1-Back Office ... sells candy, snacks, beverages, spirit novelties, and apparel items. Muskegon Career Center, "The Essentials"
Teacher Contact: Mr. Mike Reynolds 231-767-3661 e-mail Beautiful, new school store sells candy, snacks, beverages, spirit novelties, and apparel items. 2-POS Stations & 1-Office Server workstation. North Farmington High School Store (Farmington), "The Northern Edge"
Novi High School, "The Cat Rack"
Oak Park High School (O.P. 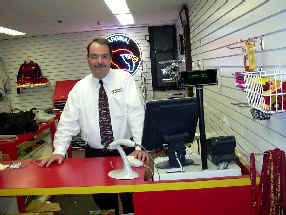 ), "The Trading Post"
Oxford High School Store (Oxford), "The O Zone"
**Steve lost his store space in 2012, but he did not let that stop them! They purchased an all-in-one unit and placed it on a cart for a mobile POS!! Pankow Vocational Center (Clinton Twp. ), "The Pankow Voc-Store"
Parchment High School (Parchment), "The Panther Pitr"
Perry High School (Perry), "Rambler Pit Stop"
Pinckney High School (Pinckney), "The Pirate School Store"
Plymouth-Canton High School (Plymouth-Canton), "The Chief Connection"
3-POS Stations...School store sells candy, snacks, beverages, spirit novelties, and apparel items. Plymouth High School (Plymouth-Canton), "The Pit Stop"
2-POS Stations...School store sells candy, snacks, beverages, spirit novelties, and apparel items. 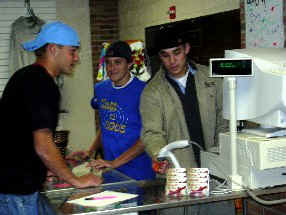 Plymouth Salem High School (Plymouth-Canton), "The Rock Shop"
2-POS Stations..School store sells candy, snacks, beverages, spirit novelties, and apparel items. 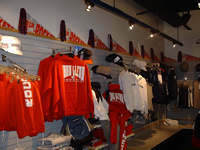 Pontiac High School, "School Store"
School store sells candy, snacks, beverages, spirit novelties, and apparel items. Teacher learned very fast! 2-POS Stations. Redford High School (Detroit), "The Redford Marketplace"
Teacher Contact: Ms. Mae Talton, 313-531-0502 e-mail The Redford Marketplace boasts a wonderful selection of School Apparel tastefully displayed. Students make and sell their own custom signs and greeting cards. Popular items are hot pockets and chips. A great selection of beverages are available too! the Marketplace is operated by 1 POS Station. Rochester High School (Rochester), "Falcon's Nest"
2-POS stations & 1-Back Office ...School store sells candy, snacks, beverages, spirit novelties, and apparel items. Teacher Contact: Vince LoPiccolo 248-726-5200 School store carries candy, beverages, spirit novelties, apparel. Just getting started with 2 POS Sales Stations & 1 Back Office Station. Students are already Printing Barcode Labels for Apparel. The Smart Gift Cards were popular at Parent Open House. Roseville High School (Roseville), "Panther Den"
3-POS Station, 2 Touch Screen, PRM with Mobil Unit ... sells candy, snacks, beverages, spirit novelties, and apparel items. Saginaw Heritage High School (Saginaw), "Campus Corner"
1-POS Station, Smart Keyboard, PRM PRO ... sells candy, snacks, beverages, spirit novelties, and apparel items. 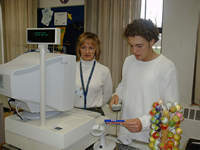 Saline High School Store, "The Edge"
Teacher Contact: Ms. Kara Stemmer 734-429-80480 e-mail Highlights of this store includes candy, beverages, spirit novelties, apparel, and Otis S. Cookies 1 POS Sales Station, Smart Keyboard, PFW with Receipt and Office Printers. Sashabaw Middle School (Clarkston), "The Cougar Cave"
Our only Middle School Store carries school supplies, spirit novelties, and apparel. 1 POS Sales Station with Receipt Printer & Office Ink-Jet Printer. Seaholm High School ( Birmingham ), "The Maple Tree"
Shepherd High School (Shepheard), "The Jay's Nest"
Skyline High School (Ann Arbor), "The Sky Store"
1-POS Station... sells candy, snacks, beverages, spirit novelties, and apparel items. 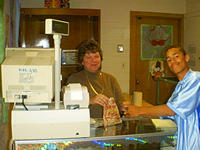 Teacher Contact: Ms. Jackie Dunlap, 248-746-8975 e-mail, Our 1st School Store! Our very 1st School Store experience! Could be one of the largest Student Stores in the state! Four POS stations (Office Server is Station 4), Touch/Smart Keyboard, PRM, sells everything from Candy, Beverages, Otis cookies, Hot Pocket Sandwiches, Apparel! This store is tastefully decorated. School store jobs are very organized and defined by an Employee Handbook. An exciting place to shop, meet friends, and learn business concepts! Using New, POSitive Retail Manager (PRM) Software, 2-Smart Keyboard + 1-Touch Screen POS Station w/Office computer. Southfield Lathrup High School Store, "The Charger"
Would you believe 3-POS Stations. 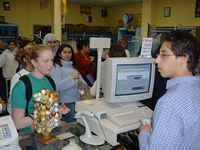 Touch Screen, PRM Students can process sales using smart-keyboards and laser scanners. School supplies, Candy, Juices, Milk, Otis Cookies make up the brisk sales here. New Cappucino Cafe is very popular! Sparta High School (Sparta), "Treasures of the Heart"
1-POS Station ... sells candy, snacks, beverages, spirit novelties, and apparel items. Note: Special needs students participate in most of the store's operations. Stone High School (Ann Arbor), "The Stop and Shop"
Stoney Creek High School Store (Rochester), "The Ranger Station"
Teacher Contact: Ms. Katlin Sanders 248-726-5700 e-mail New School store carries candy, beverages, spirit novelties, ice cream, and apparel. Just getting started with 2 POS Sales Stations & 1 Back Office Station, Smart Keyboard, PFW. Sturgis High School, "The Campus Corner"
Swartz Creek High School, "Dragon's Den"
2-POS Station, Touch Screen, PRM .School store sells candy, snacks, beverages, spirit novelties, and apparel items. Taylor Truman High School (Taylor), "Harry's Place"
T. Roosevelt High School, (Wyandotte) "The Trading Post"
Teacher Contact: Ms. Elissa Cumiskey, 734-246-1000 e-mail A gigantic store with several beverage coolers, apparel, helium balloons, school supplies, candy, snacks, and even a Food Service Counter. Hot Nachos, Otis Cookies, Popcorn, Cappucino. Yum! 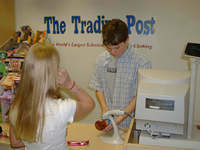 Would you believe that the Trading Post is open throughout the school day and does a brisk business every hour! 2 POS Stations and an Office Server, Smart Keyboard, PFW..
Thorn Apple High School (Middleville), "TAHS Student Store"
School-Store is using our new, POSitive Retail Manager Softare (PRM). Students Cashiers can use a cool Touch-Screen or a Smart-Keyboard. 3 Rivers High School Store, "Wild Cat Variety Hut"
Single Station POS, Smart Keyboard, PFW with Receipt Printer and Office Printer. Merchandise comprise of school supplies, apparel and spirit novelties! Scott learned the POSitive POS in 1 Day! Troy Athens High School (Troy), "The A-Station"
2-station ...School store sells candy, snacks, beverages, spirit novelties, and apparel items. Troy High School (Troy), "The Colt Connection"
Tuscola Technology Center (Caro), "The Cleaver Corner Store"
School store sells candy, beverages, spirit novelties, gifts, cappucino, and apparel. 4 Station network (1-OfficeServer & 3-POS Stations) The busiest POS station is conveniently located in the Cafeteria with a Food Court counter that greets hungry students anxious to purchase beverages, pizza, pita sandwiches, chips, cookies, and bagels! 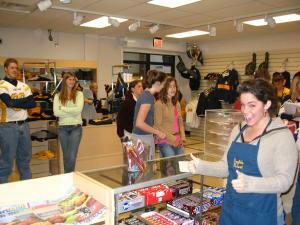 School store sells candy, beverages, spirit novelties, gifts, cappucino, and apparel. 4 Station network (1-OfficeServer & 3-POS Stations) The busiest POS station is conveniently located near the Cafeteria with a Food Court counter that greets hungry students anxious to purchase beverages, chips, cookies, donuts, and bagels! 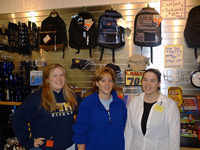 Utica Ford II High School Store (Sterling Hts. 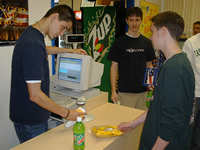 ), "Ford Dealers"
Utica Stevenson High School Store (Sterling Hts. ), "Mount Olympus Titan Shoppe"
Walled Lake Northern High School (Walled Lk), "Maroon Room"
Waterford Kettering High School (Waterford), "The Captain's Corner"
Waterford Mott High School (Waterford), "The Shipyard"
Wayne Memorial High School Store, "The Zebra Hut"
Teacher Contact: Ms. Pam Husson 734-419-2222 e-mail Wonderful shopping mall environment! Beautiful Fixtures 2 POS stations, Smart Keyboard, PFW for candy, apparel, gifts, and school spirit items. This store has its' own employee handbook. Students are in-tune with the hierarchy of job responsibilities. A well organized School Store. Western High School (Parma), "The School Store"
1-station ...School store sells candy, snacks, beverages, spirit novelties, and apparel items. West Ottawa High School (Holland), "The Wozone"
Teacher Contact: Ms. Shayna Carlson 616-994-5000 e-mail New school store sells candy, snacks, beverages, spirit novelties, and apparel items. 2-POS Stations. Western International High School (Detroit), "Strictly Western"
Wexford Career Center (Cadillac), "The Student Store"
3-POS Stations (2-Store Locations) & 1-Back Office ... sells candy, snacks, beverages, spirit novelties, and apparel items. Woodhaven High School (Brownstown), "Warrior Trade"